Freezer cooking does NOT have to be an all-day/all-weekend ordeal. Just doing some simple bulk cooking can save you SO much time in the kitchen during that dreaded getting ready for dinner time!For example, this afternoon I did a quick batch of freezer cooking with a an almost 8lb. package of lean ground beef. In just barely over an hour, I processed all the beef to yield us prepared meat for at least 8 dinners–8 hamburger patties, chili, seasoned taco meat, & meat sauce for pasta! And, better yet, it only required two dishes and such a money saver too! – place 1 quarter in the pan & 1 quarter in the stock pot. Add your favorite “taco” seasoning to the meet in the pan. Let it brown. – While those are browning, take another quarter (plus a little extra from the last quarter) and patty it up for hamburgers (I made 8 total… 6 “adult”-sized & 2 kiddie-sized). That’s enough for two dinners, plus lunch leftovers for Mr. Mom Endeavors. Place each patty on a piece of wax paper and put them in a freezer bag. – Once the meat in the pan is brown, set it aside to cool. – Add the rest of your ingredients to your pot for chili (recipe coming soon! now here) and let the chili simmer! 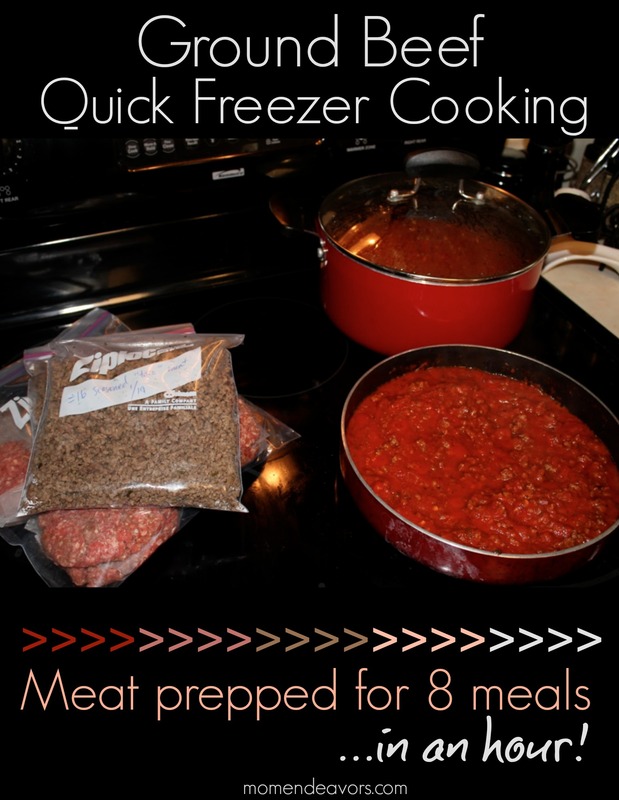 – After this, place your taco meat in freezer containers/baggies. – Use that pan to brown up your last chunk of meat. Add some garlic & tomato sauce to make a homemade meat sauce! And, voila, enough prepared meat for at least 8 meals for our family made with minimal cleanup in just over an hour (not counting the chili simmering)! Woot! Do YOU do any quick freezer/batch cooking sessions? *Linked to some of these GREAT sites! Check out more Great Ideas at Infarrantly Creative! Wow! You go girl! I am going to try this one day! Thanks for the inspiration. that is amazing! I love your prep tips! Great tips! I should be more prepared so we are not tempted to eat out when I'm not in the mood to cook. Thanks for the inspiration! I found you through the Raising Homemakers link up. Hey! Following you from Bloggy Moms!! helping you get closer to 100!!! wooohooo!!! This is awesome! I love to get things prepped ahead of time to save time later – especially with beef on sale! Thanks for the follow – following you back! Great idea! Looks like you made it to your 100! I was 101. As much as I hate to cook, you gave some great tips and even made it seem pretty painless, lol! Great idea! I'm trying to do better at meal planning and this is helpful! That is a fantastic idea! Will be trying that after the next trip to the grocery! Following you now from Bloggy Moms! I try to do this as much as possible as well! Saves so much time. New follower! Great tutorial! I agree that freezer cooking doesn't have to take a long time, but it saves so much time later. I found your post from I love naptime. What a great idea. I've never thought of prepping all of that ahead of time. Thanks for doing this! I think this is one of those ideas that was right on the tip of my tongue, but just wasn't happening! Right after I saw this, I happened upon some cheap ground meat. The next day I did: chili, cooked ground meat for tacos, cabbage casserole or spaghetti, and a couple of burgers! Thanks so much for sharing! I just bought a lot of ground beef I got on sale. I always freexe, but love the different ways you prepared it to freeze. I do this all the time, taking advantage of sales and bulk pricing. but not necessarily because I’m frugal (though I am).